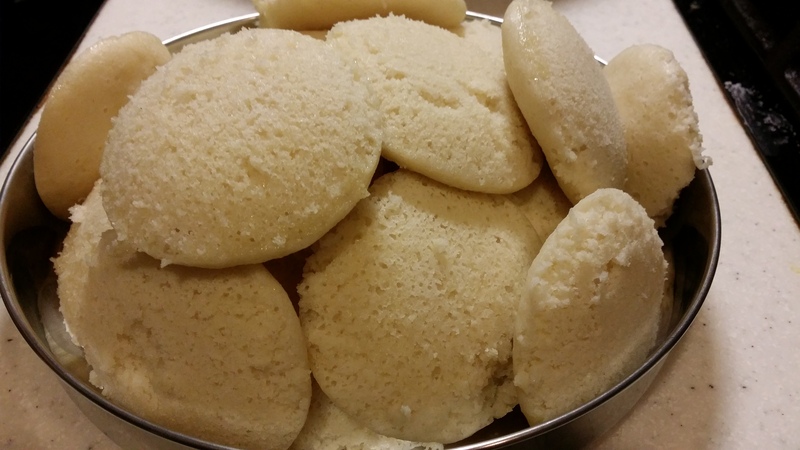 I’ve never had much luck in getting idli batter to ferment, but last night I gave it another shot! I think I know why I got it wrong all these years, I simply didn’t add enough water (silly me!). I did a little research yesterday and came across a blog on idli making and troubles that particular blogger had. She said adding more water to the batter worked for her, so I thought I didn’t have much to lose, and it worked! We had beautiful soft white idlies for dinner last night and breakfast this morning and I already have another batch of batter ready to go! I used my mother in law’s recipe with a few tweaks. Soak the rice in water and the urad dal and fenugreek seeds together for about 5 hours (two separate bowls, rice in one, dal + fenugreek seeds in another). About an hour before grinding, add the poha to the rice and allow to soak. Grind the urad dal with the water it has been soaking in until you get a fine paste. Pour into a large bowl. Grind the rice and poha mixture until fairly smooth but slightly grainy. Add to urad dal paste. Mix together by hand (this is important to assist with fermentation). Cover bowl with a loose cloth. Sit in a warm spot for 8 hours until it ferments and doubles in volume. Add salt to taste and mix gently, steam idlies for about 5 minutes. Allow to cool slightly before removing idlies from their moulds.